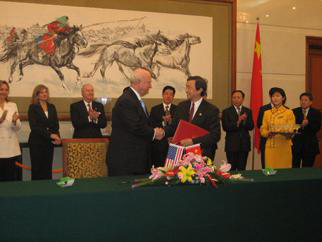 U.S. Department of Energy Secretary Samuel Bodman and Chinese Chairman of National Development and Reform Commission Ma Kai signed a memorandum of understanding in December that paves the way for a U.S.-China partnership for nuclear energy. Volume three of the Intergovernmental Panel on Climate Change Fourth Assessment Report mentions nuclear energy partnerships as key factors in mitigating future climate change. Mitigating the effects of climate change is not only cost-effective over the next 25 years, but it is actually affordable, according to the third summary report of the Intergovernmental Panel on Climate Change (IPCC), released today in Bangkok, Thailand. The third summary report, which focuses on the scientific, technological, environmental, economic and social aspects of various mitigation strategies, suggests that these strategies need to be put in place soon  perhaps by 2015  to halt the increase of greenhouse gas emissions linked to rising global temperatures. The amount of global greenhouse gas emissions in our air has ballooned since pre-Industrial times, the report said. Between 1970 and 2004, greenhouse gas emissions increased 70 percent, with carbon dioxide emissions alone increasing 80 percent. The largest growth has been in the energy sector, especially from transport and industry. If fossil fuels remain the dominant global energy source and no actions are taken to limit emissions, then greenhouse gas emissions will rise anywhere from 25 to 90 percent by 2030, the researchers said: Governments need to come up with immediate and long-term strategies to stem emissions. To that end, although the more than 2,500 scientists involved in the report agreed that "no one sector or technology can address the entire mitigation challenge," they did agree to embark on several mitigation strategies by 2030, with the most extensive changes needing to come in the energy and transportation industries. Some alternatives are already commercially available, such as switching from coal and oil to natural gas and nuclear power, or making vehicles more fuel efficient and using biofuels, especially those made from cellulose (the stalky, woody parts of plants and trees). The report also detailed some key technologies that are not yet commercialized but could be by 2030, such as efficient and regular carbon capture and storage, advanced renewable energies including tidal and better solar energies, and putting more advanced electric and hybrid cars on the road. To determine the economic impacts of these and other ideas, the authors came up with cost models in U.S. dollars per ton of carbon dioxide equivalent (the amount of greenhouse gases). The report concluded that every country should be able to afford mitigation strategies, especially if developed countries share technologies with developing nations. The economic models suggest that although some of the strategies the report recommends may require higher upfront investment, and thus some financial losses in the immediate future, in the longer term, costs will be reduced for nearly everyone. IPCC delegates told reporters at a press conference on Friday that this report should stifle arguments by skeptics, such as that combating climate change is too costly or that it would suppress development in poor countries. They said that the publication sets the stage for an even stronger international agreement than the controversial Kyoto Protocol. The Associated Press quoted Ogunlade Davidson, chair of one of the working groups, as saying, "If we continue doing what we are doing now, we are in deep trouble." The report released today is the third volume of the IPCC Fourth Assessment Report. The first volume, released Feb. 2, summarizes current understandings of the physical factors driving climate change (see Geotimes online, Web Extra, Feb. 2, 2006). The second volume, released April 6, focuses on how communities and resources around the world are already experiencing climate change, and on these communities' vulnerability and ability to adapt to those changes (see Geotimes online, Web Extra, April 6, 2007).